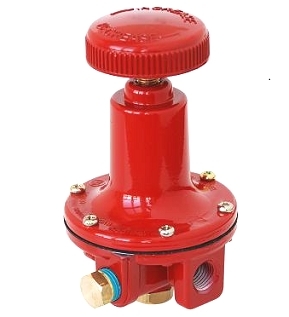 Adjustable High Pressure Propane Gas Regulator, 0-100 PSI Adjustable or Fixed, Liquid or Vapor LP Gas, Hand-Wheel, 3-5 GPH Liquid Capacity, 1/4 FNPT Inlet/Outlet/Gauge Port, UL Listed. MEGR-6120-100. Price/Each. NOTE: Not for use with gas grills and other low pressure devices. The MEGR-6120 is a medium to high capacity regulator with precise regulating characteristics allowing delivered pressures from 0-100 P.S.I. Designed for cylinder systems in liquid or vapor service. Both the inlet and outlet are 1/4" female pipe thread. A plugged gauge port is built in to accommodate pressure gauge allowing accurate monitoring of the working pressure. 0-100 PSI Propane / Gas Pressure Gauge, 1/4 Inch MNPT, 2 Inch Diameter, Steel Casesd. Price/Each. Adjustable High Pressure Propane Gas Regulator, 0-60 PSI Adjustable or Fixed, Liquid or Vapor LP Gas, Hand-Wheel, 3-5 GPH Liquid Capacity, 1/4 FNPT Inlet/Outlet/Gauge Port, UL Listed. MEGR-6120-60. Price/Each. Manchester Tank 1160TC.5 30# DOT Grade Refillable Propane Cylinder, Vertical, OPD Valve with ACME/QCC/POL Fitting. White Powder Coated Steel, 12.2 diameter x 23.4 inches tall. Holds 30# / 6.8 gallons of Propane. Price/Each. Manchester Tank 1220.136 40# DOT Grade Refillable Propane Cylinder, Vertical, OPD Valve with ACME/QCC/POL Fitting. White Powder Coated Steel, 12.2 diameter x 29.4 inches tall. Holds 40# / 9.28 gallons of Propane. Price/Each. MEC # ME1654, Propane Refillable Cylinder Fitting, Soft Nose POL x 1/4 MNPT, Brass with Plastic Handwheel. Price/Each. Roofmaster 100# Propane Cylinder Hand Cart with 4.00 x 6 Knobby tires and Tank Safety Chains. Designed for safe transport of FULL 100# LPG cylinders (23-25 Gallon LPG cylinders). Price/Each. Roofmaster #772650 DUAL 100# Propane Cylinder Hand Cart, with 4.00 x 6 PNEUMATIC Tires, Safety Chains. 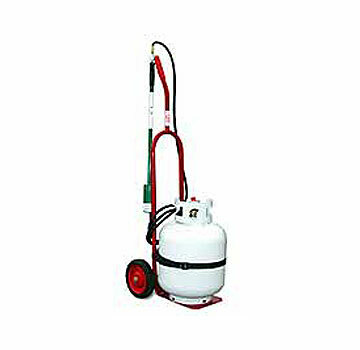 Designed for transport of TWO large 100# (25 Gallon) Propane cylinders. Price/Each. Roofmaster #596200, Double Bottle Propane Hook Up (P413). Allows two propane bottles to one regulator. Designed for LP tanks. Price/Each.